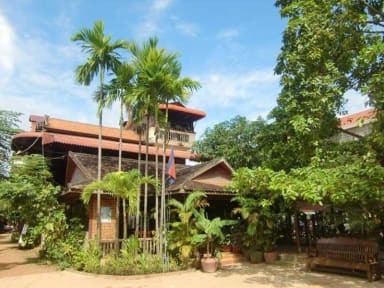 Garden Village Guest House, Siem Reap, Kambodża : Rezerwuj teraz! Garden Village is the BEST place to stay in Siem Reap. A picturesque hostel set in lush tropical gardens & near major attractions, Pub Street, Night Market & the awe-inspiring Angkor Wat temples which can be easily visited with the help of our friendly staff & tour desk. 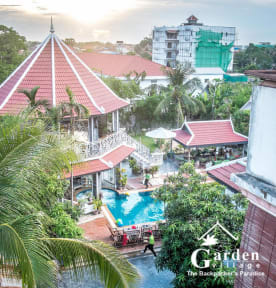 Garden Village is affordable with a great selection of rooms to cater for any budget starting from $3.50 deluxe dorms with A/C & en-suite to our luxurious Khmer style bungalow suites at $27 with free WIFI throughout the hostel. Our restaurant & pool bar are open 24/7 & serve a variety of delicious Khmer & Western favorites at amazing prices. We have a large pool, swim up bar with Jacuzzi and basketball hoop. Our hostel is large enough for you to feel free to party or relax with activities such as volleyball court, sand football pitch, slack-lines, pool table, beer pong, movie room & much more. There's always something to keep you entertained!